In my humble opinion, this is Disney's best since The Lion King. 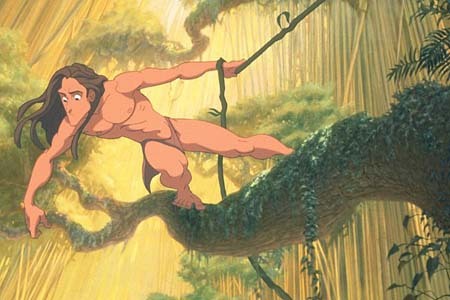 And, speaking of The Lion King, Tarzan seems to draw many parallels. This is evident in the setting, the plot, and the music. However, it does have its own uniqueness to it, and the movie can more than stand on its own as a great in filmmaking. 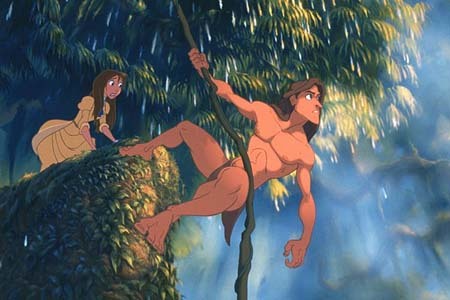 One thing that Tarzan does better than just about any film that I have ever seen is rip at the emotions. This one had me crying several times in the theater, which is quite an accomplishment because I can't even remember the last time that I allowed even one tear to fall while sitting there in the audience. One of the most touching scenes involves Tarzan with his foster mother, a gorilla named Kala, explaining to him why she does not see him as different and why she loves him. Furthermore, the animation in this film is some of the best that I have ever seen. This movie also brings with it a great deal of excitement and liveliness that is not usually present in animated films. In particular, there is a lot of speed to it as we follow Tarzan traversing the jungle at an almost reckless pace. What is perhaps so captivating about the way that it is shown to us is that we often are able to see things through his eyes and travel through the treetops from his perspective. Very cool. I also give a huge thumbs up to Phil Collins, who created some great songs for this movie. The music was a perfect fit for this movie and really could not have been done any better. It really emphasized the emotions in the most excellent way. Simply astounding. However, what this film does lack in is the backup characters and the comic relief. They just weren't as cute and weren't as funny as most other Disney films. And Rosie O'Donnell's voice just didn't fit with her character either. It was somehow inappropriate and irritating. Oh well. Whose voice was a good fit was that of Minnie Driver as Tarzan's love interest: Jane. All in all, a great movie to see, with or without the kids. How would you rate the movie Tarzan? There have been 31673 people to visit this page since Wed, Jun 23, 1999. And you are the first person to visit this page today!